Daily and Monthly Current Affairs 2018. 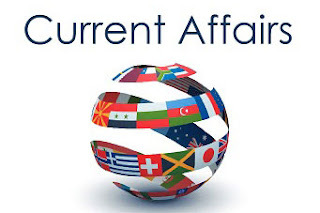 Current Affairs April and May 2018 Latest GK for upcoming competitive exams 2018. SSC CGL CHSL and MTS Exam free study material. • India will be attending the Shanghai Cooperation Organisation-Regional Anti-Terrorist Structure Legal Experts meeting which will be held in Islamabad, Pakistan. • This will be Pakistan’s first SCO meeting, as the country along with India became a member of the organisation in June 2017. • The meeting will be focused on the terror threat faced by the region & ways to enhance counter-terror efforts. • India ranked at 44th place in terms of competitiveness in the annual rankings compiled by International Institute for Management Development (IMD). • As per the rankings, the US is the most competitive economy, followed by Hong Kong and Singapore in the second and third place. • Out of the 14 Asian countries on the list, India ranked 12th. • The Union Government reconstituted Financial Stability and Development Council (FSDC) to include secretaries from revenue department as well as Ministry of Information Technology (MeitY). • It will also include the Chairman of the Insolvency and Bankruptcy Board of India (IBBI). • This decision will make FSDC more broad-based to incorporate changes in economic regulatory framework of the country. • The 5th India-CLMV (Cambodia, Lao PDR, Myanmar and Vietnam) Business Conclave was held at Phnom Penh, Cambodia. • It was jointly organised by Ministry of Commerce & Industry along with Ministry of Commerce of Cambodia. • The Confederation of Indian Industry (CII) is institutional partner of the event. • Kerala will soon inaugurate the world’s largest bird sculpture, Jatayu Earth’s Centre in Thiruvananthapuram. • The replica of bird ‘Jatayu’, a character in the Ramayana is 65 feet tall & is positioned right at the top of a rock situated 1000 feet above sea level. • The rock ‘Jatayupara’ where the structure is based, is the place where Jatayu fell after its wings were cut by Ravana. • Indian Navy conducted an exercise called Prasthan in the Western Offshore Development area in Mumbai. • The exercise is held once in every 6 months and aims at integrating maritime stakeholders including, Navy, Coast Guard, Air Force, ONGC, Customs & Port Trust. • The drills were focused on fire on an oil platform, Oil spill, search and rescue for crashed helicopters, etc. • Paytm announced a programme called Paytm AshaKiran, which aims at educating rural women about financial services. • It will help in creating new job opportunities in small towns & cities of India. • Paytm has partnered with United Nations Development Program under its Disha project to mobilize self-help groups and organize workshops. 3. As per the State of Global Air Report 2018, over 95 percent of the world's population is breathing unhealthy air. The report was released by which organisation? 5. Which Ministry recently released the draft of the National Clean Air Programme? 8. Which nation has opened its first pubic movie theatre? As per the State of Global Air Report 2018, over seven billion people that account for more than 95 percent of the world's population are breathing unhealthy air and live in areas of unsafe air. The report was released by the Health Effects Institute (HEI) on April 17, 2018. Assam government’s new cashless health scheme, 'Atal Amrit Abhiyan' has been launched by Vice President M Venkaiah Naidu. The scheme will offer free medical care of up to Rs 2 lakh to every individual belonging to Below Poverty Line (BPL) and Above Poverty Line (APL) families. Gujarat has launched 'Haemophilia Jagruti, a magazine to spread awareness about haemophilia, an inherited bleeding disorder, on the occasion of World Haemophilia Day. The tri-monthly magazine aims to share knowledge and the research being done on the subject. The German police raided sites across the country on April 18, 2018 in a crackdown on human trafficking and forced prostitution. The raid, which also involved Germany's GSG9 special operations police unit, represented the biggest mass search in the history of the nation’s police.